Laser-assisted surgery is a well-established method of skin resurfacing, particularly used nowadays in aesthetic dermatology issues. Particular “fractional” CO2 laser systems have been developed in order to achieve good clinical results in resurfacing without causing extensive tissue damage and subsequent long downtime periods for the patients. These devices produce “micro-ablation” of the epidermis and thermal effects of the dermis although the areas of ablated tissue are microscopic, thanks to their particular pulse shape. 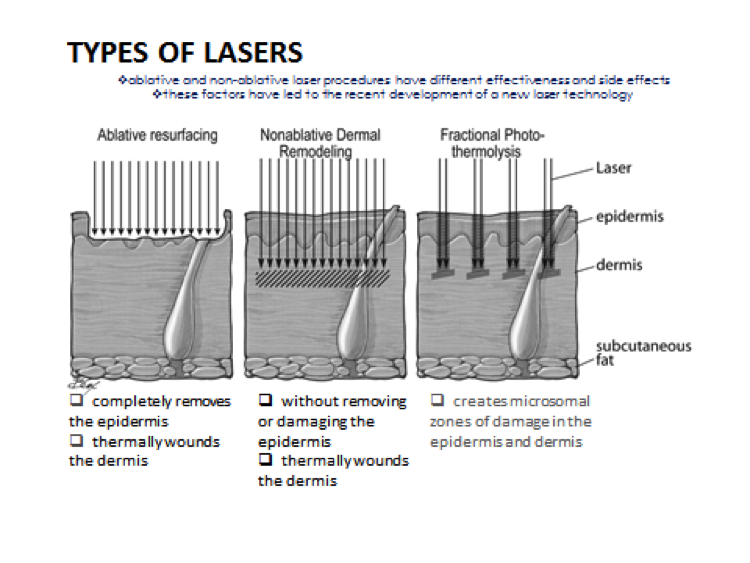 Normal skin is preserved in the areas surrounding each microcolumn of laser irradiation, and healing time as well as scarring risks are minimized compared with conventionalablative systems. Wound repair after ablative fractional resurfacing CO2 laser seems to possess some peculiarities. In particular, it is an effective wound healing modulator by acting on the cytokine pathways of tissue repairing mechanisms. Consequently, fractional CO2 laser may promote cell replication, but at the same time, it seems able to balance collagen organization against excessive fibrosis, thus avoiding aberrant wound healing. Thus, fractional CO2 laser may be proposed in the management of vitiligo in selected patients who did not receive any evident benefit from previous treatments. In fact, the proliferation and repairing mechanisms following fractional laser treatment could also consistently lead to stimulation and reactivation of pigmentation. Various means of skin ablation besides fractional CO2 laser, either alone or in combination with other treatments, were reported to induce repigmentation of vitiliginous lesions. Using lasers can be an effective drug permeation-enhancement approach for facilitating drug delivery into or across the skin. The controlled disruption and ablation of the stratum corneum, the predominant barrier for drug delivery, is achieved by the use of lasers. 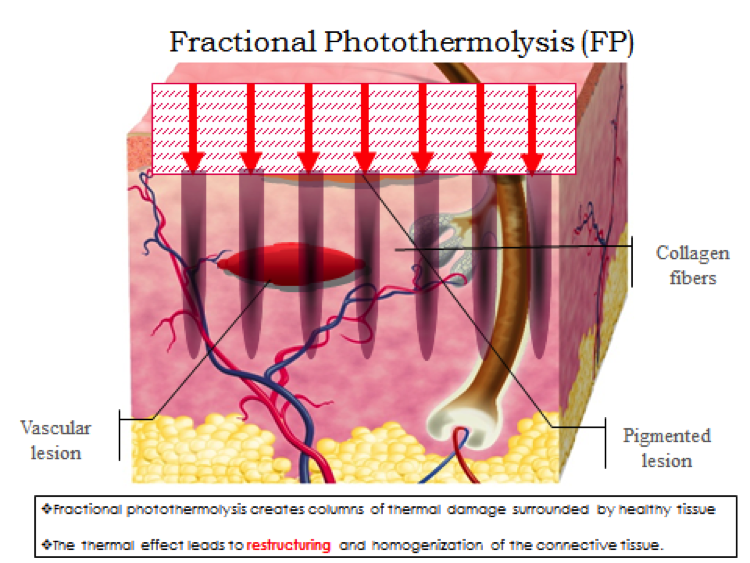 The possible mechanisms of laser-assisted drug permeation are the direct ablation of the skin barrier, optical breakdown by a photomechanical wave and a photothermal effect. It has been demonstrated that ablative approaches for enhancing drug transport provide some advantages, including increased bioavailability, fast treatment time, quick recovery of stratum corneum integrity and the fact that skin surface contact is not needed. Histologic slide of human skin after fractional photothermolysis, demonstrating two microthermal zones at a depth of 560 milimicrons. 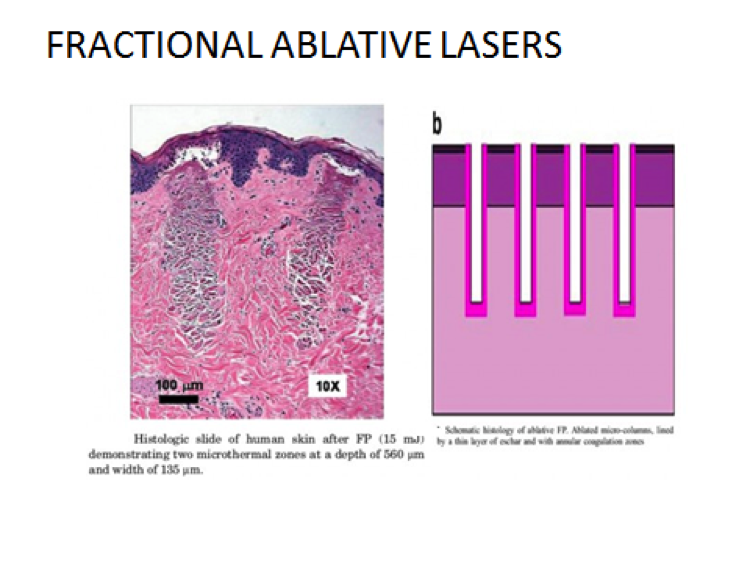 And a scheme of impact of fractionated ablative lasers.